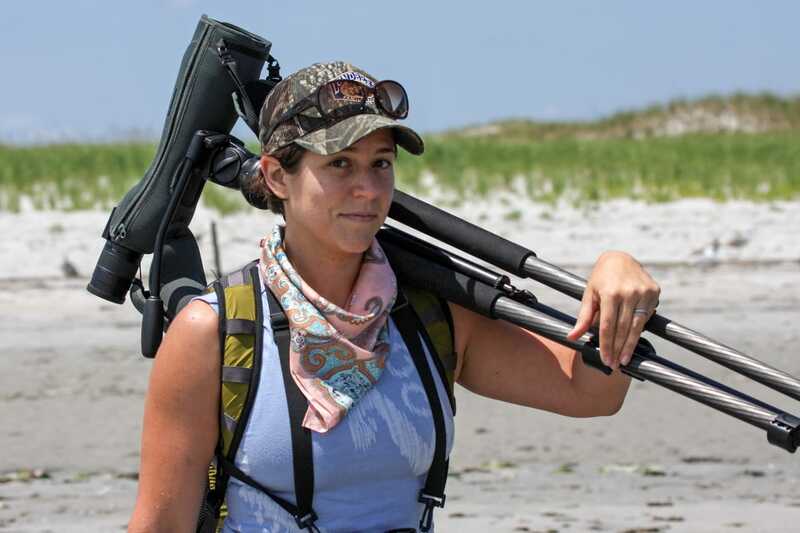 Monica Iglecia is the Assistant Director, Shorebird Habitat Management, where the goal is to increase the capacity of both public and privately-owned wetlands to benefit shorebirds throughout North America. Manomet’s Habitat Management Division works with national wildlife refuge managers, state wildlife managers, farmers and private organizations to improve habitat for shorebirds. This interview is excerpted from the Fall/Winter 2016-17 edition of Manomet’s Partnerships for Sustainability magazine. To read the complete interview, click here. How did you become interested in Habitat Management? I’ve been interested in wildlife for as long as I can remember. I used to leaf through the pages of my grandparent’s National Geographic collection and be amazed and inspired by all the incredible creatures that we share the world with. When I first experienced spring migration in the San Francisco Bay, I really connected with shorebirds. The clouds of Western Sandpipers and Dunlin moving around the bay are quite a sight to see! This also opened my eyes to all of the people who manage the places that shorebirds use throughout the flyways. The San Francisco Bay’s salt ponds and wetlands are a good example of how complex and important managing habitat is for the long term conservation of shorebirds. What’s neat is that shorebirds use a variety of habitats—some that might be surprising because they aren’t always a “shore.” For example, Buff-breasted Sandpipers (buffies) spend their winters in the flooded grasslands and grazed pastures of Argentina, Brazil, Uruguay, and Bolivia. Most buffies migrate through the central United States and Canada using prairies, agricultural fields, and marshland edges as stopover habitat along the way. The tallgrass prairie habitat in the Flint Hills of Kansas and Oklahoma hosts more than 30% of the global population of buffies during migration. This area was designated just this year as a Landscape of Hemispheric Importance in the Western Hemisphere Shorebird Reserve Network—a very exciting conservation action. Once buffies finally reach the grassy wet meadows of the arctic in the summer, that’s where they make their nests and rear their young before heading back south. They do this every year! The stories of individual birds really bring this migration saga to life. One of our partners at SAVE Brasil, Juliana Almeida, banded a buffie during the breeding season on the extreme northern coast of Alaska with another Manomet partner, Rick Lanctot of the U.S. Fish and Wildlife Service. Several months later, while monitoring buffies at her study site in southern Brazil’s Lagoa do Peixe National Park, Juliana was overwhelmed with excitement when she spotted the bird that she had banded in Alaska, 9,000 miles away. In the next five years what do you envision is possible for shorebird recovery? I am optimistic about what’s possible for shorebird recovery in the next five years, and beyond. Through our workshops, we’ve engaged and connected over 340 people from nine countries, including 21 U.S. states and six Canadian provinces. These people represent habitats in all of the Flyways of the Americas. Once the workshops are over, we keep building on the relationships we’ve developed so that we have a growing network of shorebird habitat managers. Where there are challenges, we work to find win-win solutions. Where information is lacking, we share and exchange knowledge so we can find answers together. This is how we inspire action that can lead to long term change to benefit shorebirds. The challenges for shorebird recovery are great, but the pillars of our conservation program and its efforts are strong. By building this vast network of people, we’re making a real difference for shorebird conservation. The challenges facing shorebird populations today can feel overwhelming. With so many daunting hurdles for these birds, what can one person do to help? It can leave you thinking that there is too much to be done. It can feel impossible. This is far from the truth. Getting outside and getting to know the birds and other wildlife that use nearby beaches or your local wetland can be a first step. Introducing kids to birds will help them grow up to appreciate the sounds of sandpipers overhead, help them connect to the cycles and seasons of migration, and can help build the culture of supporters that it will take to protect these birds. There are some easy actions you can take to make the wetlands and beaches more safe for birds: Don’t let your dog run loose, don’t drive on the beach, obey sanctuary and refuge signs, pick up loose trash, keep your cat indoors, and encourage your friends and family to do the same. These easy-to-do actions contribute to shorebird conservation. It takes a community! To read more about Monica’s work, visit the Shorebird Science blog.